When I was a boy there were not mountain bike in Italy. Having grown up in a village on the coast, between sea and mountains, it was natural to get interested in outdoor sports … a continuation of childhood games. My dream was to go cycling, I was a fan of Moser, but my family could not afford a racing bike … so I continued to practice all the sports that I could afford and that are primarily taking place in the street, in the country – with all kind of cheap bikes – and on the beaches. That was my gym! The mountain bike in Italy arrived at the beginning of the nineties. One of the first mtb in Italy was the “Bianchi Ragno”. It was the 1992, I worked hard all the summer to buy it… but was stolen just in front of the police station… Anyway, I do not believe in destiny, I knew my engagement with proper bilking was going to happen. In the while, after competitive soccer I practiced both swimming and long-distance running, with good results at a competitive level. I needed a bike to get close to the triathlon. It was the 2007, I started looking for a good second hand bike and so I met a guide who was working with a British tour operator. He gave me the bike for free, I thought: REALLY??!! He told me to try it, to train hard and, if I became good at it, I would have ride a tour as second guide, for a test. REALLY!? The day after I took the bike I climbed very easily the highest mountain in front of my village. 1000 m of off road ascent. It is still a must for all Sardinian bikers, the mtb in Sardinia was borned here! I was incredibly happy when I got the top… but on the way down I understood I had to practice the technique… It took me four years of passion, fun and scars to win all the challenges and have fun on all the technical downhills and uphill sections. I like all challenges. I became a good mtb guide, at least they said so. I also got three different certifications : “MTB maestro” from Italian cycling federation, “MTB guide” for Italian association of mtb guide, MTB instructor for MIAS (UK). However, I always think of my kid’s dream, I had never betrayed that dream, Moser, the “Giro”, a racing bike. In the 2009 they gave me a road bike to ride the Ghisallo, Mortirolo, Gavia, Stelvio, Costalunga, Sella, Gardena, Campolongo, Pordoi, Fedaia, Valles, Rolle, Croce d’Aune, Grappa. REALLY?!! I felt in love with the road bike and all those challenges. Despite we have no respect for the world, we live in a beautiful world. That why I love also the enthusiasm of the exploration. In 8 years I have explored all Sardinia, Corsica, Alps and Dolomites, Garda Lake, Italy north to south via Apennines. Tuscany. Sicily, Lakes of Lombardy, Switzerland, Puglia. 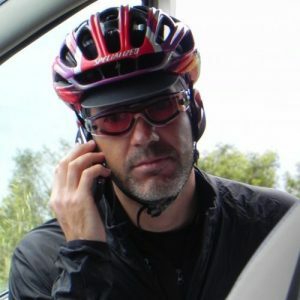 My past with sports helped me to deal with tours very challenging – I like challenges and them attract me – but the athletic training was not the key aspect that has allowed me to make the passion for cycling a job opportunity. A guide is more than just an athlete, each tour leader has a wealth of skills and capabilities that go far beyond the sporting aspect. In my case I think it has helped me, in addition to knowledge of the English language, a good organizational skills, continuous thirst of knowledge of the territories I have crossed, combined with a good sense of direction, the ability to solve problems, a lot of attention to the riders and every aspect of the tour, from the overall view till the small details, especially to understand the people. Everyone is different and a good guide must understand what everyone wants, the little problems and different needs, what each one expects from the trip. And in the end, they say goodbye, all of them with good memories, and you can understand they are already thinking to the next trip together. I have crossed Sardinia from north to south by mtb almost 20 times, and explored everywhere by road bike. I have climbed the Stelvio or the Mortirolo about 30 times. Every time is a new joy! However, the great satisfaction to conquer these epic passes is not the greatest satisfaction. The greatest award for my efforts is to see the happiness and thankfulness in the riders eyes. That is the best part of my job, I guide them working hard in the backstage, so everything go as smoothly as possible, I really want to help them to have an epic holiday. There is nothing better that reach this goal and got a new bike mates. All this experience gave me not only the vivid memory of landscapes and beautiful scenery, which provide an experience that can not be expressed in words, but above all the pleasure of sharing those moments with people like me, who love the bike and exploring, getting in touch with the land which we cross. The world is like a book, those who do not explore read only a page. Who explores with a group, on two wheels, has the time to look around and stop and talk. He has the courage to be adventurous, the ability to accept the challenges, the capacity to suffer to reach the goal without discouragement for mishaps, indeed, appreciating every moment of the trip, just for the pleasure of traveling the world. With many of the people I had the pleasure to guide, the cycling holiday has created a special bond, it is normal when you pedal, you suffer, you eat together and laugh together for a week, uniting us a sense of camaraderie and a satisfaction to have completed the itinerary. Ready for a new journey.